Interface for matching two-stage exams. TORONTO, Oct. 21, 2015 /CNW/ - Working with five leading universities in North America during 2014-15, Crowdmark, Inc., a collaborative online grading and analytics platform, has demonstrated the benefits and advantages of using two-stage examinations in a number of undergraduate programs in post-secondary institutions across the world. Crowdmark has worked with universities to introduce two-stage exams as a way to integrate collaborative learning and assessment into the traditional exam format. In a two-stage exam, students individually complete the exam and then, working in groups of three to four, immediately complete the exam again. This method provides students with immediate feedback through discussion with their peers as they deliberate the most correct response. The two-stage exam provides feedback on individual performance while increasing students' engagement and comprehension of course content. James Colliander, Crowdmark Founder/CEO and Professor of Mathematics at the University of British Columbia is encouraged by the reception two-stage exams have received at universities in North America. "The experiments with two-stage exams last spring were very informative and helped shape our platform to support a new and emerging assessment scenario," says Colliander. "Also with feedback from our customers, we made elegant improvements allowing Crowdmark to be used for other assessment types including lab reports and group projects." The collaboration in piloting two-stage exams between Crowdmark and the universities of Manitoba, Alberta, Queen's, British Columbia, and Southern California has received overwhelming support from both students and faculty. "I definitely feel like I learn more and I remember more with two stage exams," says Sammi Wong, an Arts student at UBC. Studies have found that two-stage exams result in increased student performance and information retention, because after completing the individual exam students are provided with immediate and informed feedback from their peers. Crowdmark recognizes that two-stage examinations may not be ideal for all academic programs; however, they may offer a more valuable alternative to traditional exam formats in some subjects. Crowdmark is an online grading and analytics platform that enables educators to evaluate assessments more effectively than ever before. The company was established by Professor James Colliander and graduate student Martin Muñoz, then in the Department of Mathematics at the University of Toronto, in collaboration with MaRS Innovation. 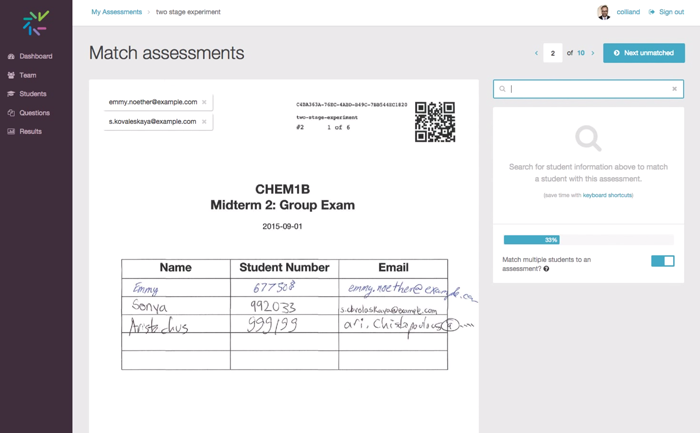 Crowdmark allows educators to collaboratively grade a variety of assessment types, including handwritten assessments, securely in a web browser.